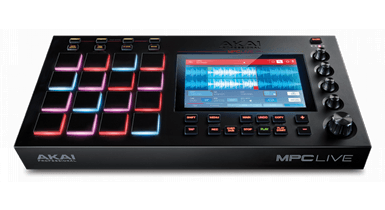 A lazy version of this review would link back to our coverage of Akai’s MPC Touch, and say “See that – it’s just like that, but standalone!” There is some truth in that, but it’d definitely be missing out on the bigger picture. So let’s make more effort, and discover what makes the MPC Live different from its predecessor. We’ll also do this without dwelling on Akai’s long history with hardware samplers – I’ve never owned or used an MPC, and I’m guessing most readers under a certain age haven’t either, so let’s leave the nostalgia-wallowing to the oldsters. 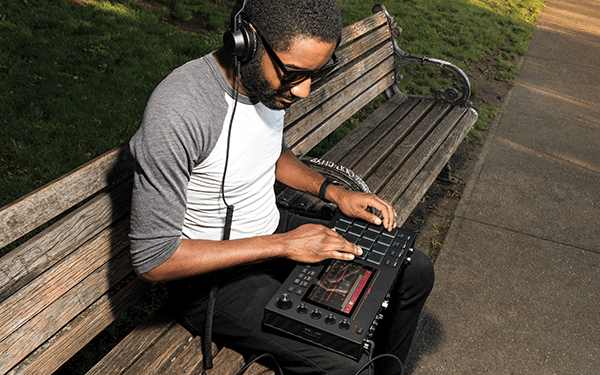 Unlike the MPC Touch, which is purely a controller and interface for Akai’s MPC software, the Live is a genuinely standalone hardware unit; it doesn’t need a computer to help it create beats, melodies, or even entire arrangements. However, despite that critical standalone status, it can step up and control the MPC software on a Mac or PC, just like the Touch, so it’s as versatile and inclusive as you need it to be. The box contains the MPC Live, a mains power supply, USB cable, printed Quickstart Guide, and instructions for installing the MPC software on your computer. First impressions are that the Live is solidly built and reasonably compact, while maintaining a sensibly spaced control layout. 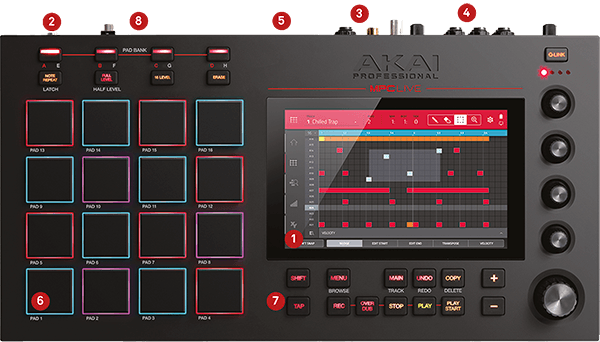 The top panel features 16 velocity-and-pressure sensitive rubber pads with RGB backlights, five touch-capacitive ‘Q-Link’ encoders, a bunch of buttons, and a 7″ multi-touch display. From above, it does look exactly like the MPC Touch, but the Live’s housing is deeper, top-to-bottom, and the rear panel is spectacularly well-endowed, with a master volume knob, 3.5mm headphone jack, six 1/4-inch outputs, Kensington lock slot, record volume knob, phono inputs with a ground peg and line/phono selector switch, two 1/4-inch inputs, SD card slot, two MIDI inputs and two MIDI outputs, two USB A plugs, one USB B plug, mains-power input, and an on/off switch – nice work fitting all that in! I’m obliged to moan about the lack of a 1/4-inch headphone jack, but no complaints other than that. The Live contains 16 GB of internal memory, and a 2.5-inch SATA connector, so an HDD or SSD hard drive can be installed for even more storage, and there’s also a rechargeable battery in there, providing up to six hours of mains-free jamming on a 45-minute charge. My review example arrived fully charged, so within a few minutes of unboxing, I put it in a bag with some headphones and went to a coffee shop for my first session. The MPC Live weighs 2.7kg, which isn’t bad for such a sophisticated music device, though in truth, it’s a bit much to carry every day, unless you’re a most dedicated user. I began by exploring the pre-installed demo content, which gives a good representation of what’s possible. The projects cover genres such as hip-hop, chilled trap, and tech house and include one-shots, loops, and playable instruments; spending some time with these demos will help you get a handle on just what the Live is capable of. It takes a little while to grasp the layout and figure out what to push, tap, or swipe and when, but it soon becomes second nature; in terms of complexity, the MPC Live sits between Pioneer’s Toraiz SP-16 (more simple), and the Elektron Octatrack (more obscure and techy), and it’s accessible enough that you can start working immediately. Having explored the demos, I started a new empty project, previewed and loaded a drumkit, created a bass instrument track, and programmed patterns for both of them. 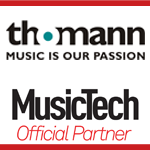 There are plenty of options to suit your preferred working methods – you can record your parts from the pads in real time, complete with quantisation, draw them on the touchscreen, or return to the pads to enter notes step-sequencer style. In truth, the pads are so good on this thing that I found myself opting to record in real-time much more than usual. 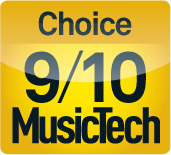 No matter what input method you prefer, there’s a reasonable level of MIDI editing available afterwards; it’s not up to deep DAW-style functionality, but good enough to get the job done. Once you’ve created some patterns, you can play them back manually, or organise them into a song that you can play back in a programmed sequence. The MPC Live is a real sampler, so it’s as much about capturing and customising your own sounds as it is programming, or using library content. Material can be imported from a USB drive connected directly to the Live, or sampled from the left/right inputs on the back, or from a turntable connected to the phonos (but not all at the same time). The resulting samples can be tuned, chopped, sliced and looped, and triggering them can be as straightforward as launching a loop or one shot from a pad, or it can involve building multisamples with velocity-based layers, or melodic sample-based synth instrument setups. Beyond traditional sampling activity, the MPC Live introduces full linear audio-track recording and editing, with individual processing and relocating of audio regions, as well as real-time time stretching and pitch-shifting, so it really can function as a self-contained DAW in a hardshell. Also new, on the performance front, is clip launching, where the Live’s pads become a 4×4 platform for playing clips, in a familiar Push/Launchpad style, with everything quantised, and triggered pads flashing before coming into play. It’s not as fully evolved as something like Ableton Live, because, of course, that’s what Live (the DAW!) specialises in – but it is very impressive, fun and totally usable as a performance tool. Audio effects are the icing on the cake for all of this programming and sampling and jamming, and the MPC Live offers way more than the usual limited hardware options, including (amongst others) compressors, delays, distortions, EQs, and reverbs. Effects can be added during audio recording, and ‘printed’ to disk with the sample, which isn’t something I’d do in a studio situation, but in the more immediate world of live performance, it skips a step or two while capturing content on the fly, and there’s also the lovely XYFX page, which turns the display into a Kaoss-ish touch pad for effects control. If you really want to be dogmatic about it, you could achieve a finished-feeling final mix using only the MPC Live. And throughout it all, the hardware experience makes itself evident – at times, you’ll miss the expanse of a computer screen, and the crazy world of options that go with it, but the MPC has an incredibly tactile set of pads and chunky controls, a true multi-touch screen, and there’s the magic of hardware – the focus it brings, as emails and notifications and selfies are forgotten for a while, and there’s just the hardware and the music you’re making. I’m totally comfortable making music with software, and unlike some folks, I don’t feel guilty about it at all, but it’s refreshing to go out with a dedicated piece of hardware and some headphones, and jam and create without distraction. Naturally, you’ll want to share the final result with the outside world; you can move the project to your computer and open it in the MPC software, but for ultimate tweaks, be aware that the MPC software can run as a plug-in inside other DAWs, such as Live or Logic Pro; worlds within worlds, it’s very deep. 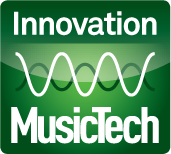 If moving to a computer isn’t possible or just not on your list of favourite things, you can render your arrangement directly as a stereo file (AIF, WAV, or MP3, up to 32-bit/96 kHZ) to the onboard hard drive, or connected storage. And while we’re discussing the ‘outside world’, let’s consider that the MPC Live features Bluetooth and Wi-Fi, which could provide interesting new options for file sharing, or online software updates, or accessing cloud-based content libraries. I don’t know for sure, because these features aren’t present in the current release – although it should be coming soon. A major benefit of this wireless functionality will be Ableton Link support, which will be excellent; imagine an MPC Live running off the internal battery, sync’ing wirelessly with iOS devices, or computers, or other MPCs; I can’t wait! Link is just one sign that the MPC is very much intended to integrate with other hardware; after all, it has those MIDI ports as well, which can be used simply to sync with external synths or drum machines, or as part of a more complex relationship involving programming MIDI patterns on the MPC Live to trigger sounds from the other devices, in a nice, stable computer-free environment. I tested this concept with a Novation Circuit, sync’ed via MIDI out from the MPC Live, and then routing the Circuit’s left/right audio outputs into the Live’s audio inputs, and through some of the internal effects, capturing a few samples along the way. The two worked very well together, the Circuit adding real-time synth fun, while keeping a fully battery-powered operation (Circuit can run off AA batteries). I wished for another pair of audio inputs, though, so I could add a second synth or drum machine, taking the Live’s ‘rig hub’ status up another notch (the forthcoming, larger, MPC X does have more inputs, though). The layout is well-organised and fast to use, but no control surface does it all, which is where those USB type-A slots come in – they’ll host and power class-compliant USB MIDI controllers. I tried a Faderfox PC24 and a Novation Launch Control XL, and they both lit up and worked perfectly. If keyboards are more your thing, add a MIDI keyboard – I connected an old M-Audio Oxygen 25 and it worked straight away. The MPC Live works well enough on its own, but we all have our personal takes on MIDI control, our favourite input devices and hardware synths, and it’s good to see that acknowledged. On the topic of expansion, if you’re seriously considering using the MPC Live, I’d fully embrace the standalone/mobile ethic by budgeting for an internal SSD to save a lot of trips back to the computer, and a bag or case as well… or some bubble wrap, at least. The MPC Live is the next logical step after the MPC Touch – it does everything that the Touch does, and more, with all the computer interaction that goes with it, but the standalone independence steers it in a completely different direction. This is an incredibly versatile machine, being a self-contained platform in its own right, but also working as a control surface with Mac or PC, so it goes where you go, where your projects go. If you like options, this has got your name all over it; play beats and clips across the pads, play keyboard instruments, program MIDI patterns, capture audio for live sampling and looping, create full arrangements, and mix them down afterwards. For most users, it’ll be the standalone qualities of the MPC Live that’ll draw them in; I really liked the MPC Touch, but at times, I felt it was such an almost-hardware experience it was kind of frustrating it couldn’t truly be used standalone. The MPC Live brings the whole package – the pads, the display, the sampling, audio tracks and clip launching, elevating it above the competition in terms of what can realistically be achieved with a standalone box. 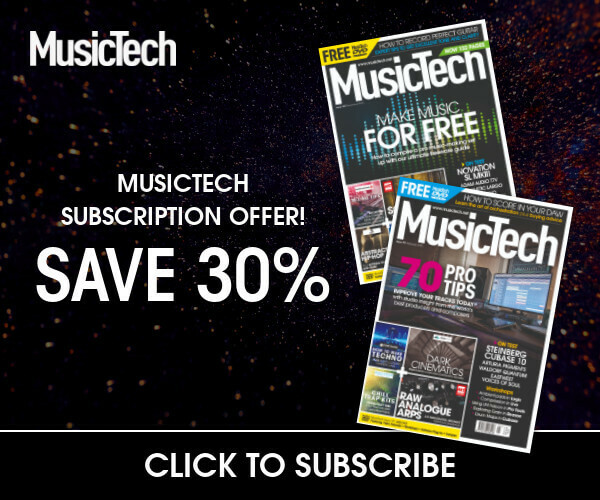 If you want deep hardware sampling, sequencing, and – well, a hardware DAW, which is what it is – the MPC Live is currently the best option. 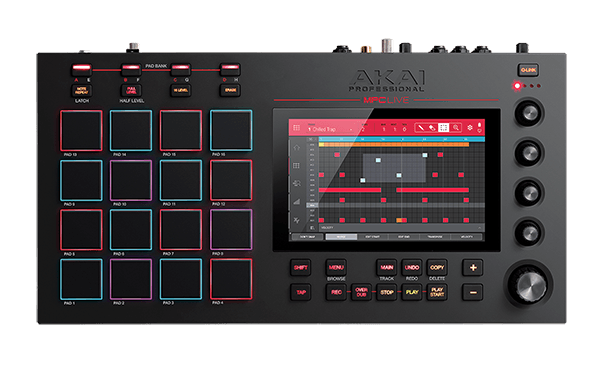 The more ambitious samplist might look ahead to the imminent MPC X, which will be Akai’s new flagship standalone sampler: including a larger display, 16 pots with individual status displays, two mic inputs, and 8 CV/gate outputs. If you’re coming to hardware and performance sampling from a DJ background, you might feel more at home with the SP-16, although that’s not to say other people won’t enjoy it as well, especially with that Dave Smith Instruments analogue filter. The SP-16 is relatively basic, but well built and a lot of fun to use. The Octatrack is a real love-hate device, and way too complex for a lot of users, who were expecting ‘Ableton Live in a box’, but it is capable of wonderful things if you put the time into it. Not keen on that Compact Flash storage, though. See also Elektron’s new Digitakt, a more straightforward drum machine/sampler.